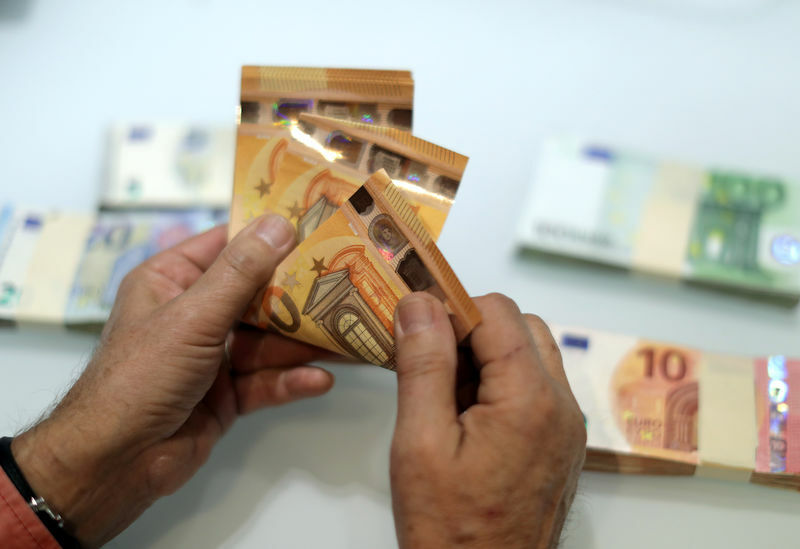 LONDON (Reuters) – The euro rallied on Monday as a fall in Italian government borrowing costs after their recent surge introduced some calm into the market, while the promise of more Chinese stimulus helped offset broader political worries. Rating agency Moody’s downgraded the Italian government’s credit rating on Friday but unexpectedly kept the outlook at stable. That, together with comments by Deputy Prime Minister Luigi Di Maio that the government was ready to sit down with the European Union amid the ongoing row over Rome’s budget, boosted demand for Italian debt after a sharp selloff in recent weeks. The euro has often fallen this year when Italian government bond yields have spiked higher. The single currency rose 0.3 percent to $1.1550 (EUR=), hitting the day’s high and away from recent lows of $1.1433. The dollar index dropped 0.3 percent to 95.472 (DXY). The euro was also 0.2 percent higher at 1.1487 Swiss francs (EURCHF=), and gained 0.2 percent versus sterling to 88.26 pence (EURGBP=). Despite the euro’s rally, analysts said it remained at the mercy of Italian developments, with a great deal of uncertainty ahead. “…A full diary of risk events over the next two weeks and little to argue in favor of support from the ECB (European Central Bank) in the near future, the question remains over how far the yield gap can blow out and how this could translate back into the FX market,” said Simon Derrick, chief currency strategist at BNY Mellon. Equity markets were largely in positive territory as hopes that China’s tax cuts next year could be worth more than one percent of gross domestic product sparked a rally in Asian shares that fed across to Europe. That helped offset geopolitical concerns about the rift between Saudi Arabia and the West over the killing of a prominent critic of the kingdom, as well as worries about Britain securing an exit deal with the EU. Forex markets were largely quiet, although the more positive tone at the start of the week did buoy sentiment. For the dollar, a hawkish Federal Reserve and signs of continued strength in the U.S. economy remain key drivers. “Markets will be closely watching the release of the U.S. advance GDP number on Friday for more clarity on the direction of the U.S. dollar,” said Sim Moh Siong, currency strategist at Bank of Singapore. The dollar rose versus the Japanese yen . The yen fetched 112.71, down 0.2 percent on the day and off a one-month high of 111.61 touched on Oct. 15. The yen had benefited from rising risk around Brexit, the Italy budget plan and trade tensions, because investors tend to buy the Japanese currency when they are nervous. The Canadian dollar changed hands at 1.3080 on its U.S. counterpart, within striking distance of a five-week low of 1.3132 hit on Friday on the back of weaker inflation and retail sales. The Australian dollar , often considered a barometer for global risk appetite, traded at $0.7122, flat on the day.